Order any Burritos in a Box for six or more for tomorrow (June 30) from Chipotle Mexican Grill, and not only will Chipotle take half off your order, but will also throw in a day pass for any California state park as well! You had me at half off, Chipotle! Chipotle locations can be found throughout the Inland Empire, including San Bernardino, Rancho Cucamonga, Redlands, Upland, Montclair, Chino Hills, Victorville, Apple Valley, Barstow, Mira Loma, Riverside, Norco, Hemet, Menifee, Murrieta, Temecula, Palm Springs, Palm Desert and La Quinta. So…would the second one be a FREEppuccino? Heh. Target Starbucks locations are offering buy-one-get-one-free Frappuccinos through Monday (July 2). Inland Empire Target Starbucks locations include Redlands, Ontario, Rancho Cucamonga, Fontana, Chino Hills, Apple Valley, Hesperia, Riverside, Moreno Valley, Norco, Mira Loma, Murrieta, Menifee, Lake Elsinore, Hemet, Palm Desert, La Quinto and Indio. 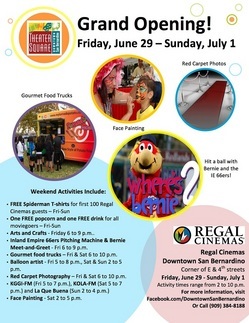 Following three days of charity previews, the Regal Cinemas San Bernardino Stadium 14 and RPX opens today (June 29) in downtown San Bernardino. There’s lots of giveaways to be had (including one free popcorn and soda through Sunday to all moviegoers), but most important to us, a trio of food trucks from 6 to 10 p.m. tonight and tomorrow (June 30) night. The theater is at 450 N. E Street in San Bernardino. The mid-week Fourth of July holidays seem to confound everyone. We work a couple of days, take a day off to head to the beach, barbecue and shoot off fireworks, and then head back to work again the next day. Even Burger King seems a little confused. The fast food chain is celebrating Independence Day a little early, offering customers an original chicken sandwich for only $1.04 today (June 29) through Sunday (July 1). For more information, click here for BK’s Facebook event page. Burger King locations can be found throughout the Inland Empire. Baker’s Drive-Thru is piling on the deals this week! Today (June 27) is the usual Wednesday 60th anniversary 60¢ deal. This week, you’ll save 79 on up to two original tacos. Then tomorrow (June 28), Baker’s has promised a coupon for a free bean, rice and cheese burrito. You can get to today’s coupon by clicking here. Tomorrow’s coupon will be found on Baker’s Facebook page. As with all Baker’s coupons, you can either print the coupon or show it on your mobile device. The usual restrictions apply: There’s a limit of two 60¢ tacos or one free burrito per coupon, one coupon per person or per car, and the offers are not valid with other coupons, discounts or coupons, although they suggest on Facebook that you pair your two tacos today with their other current offer, $1 iced tea. Whatever. To catch all of Baker’s frequent deals, be sure to “Like” them on Facebook. If you’re out and about on July 4 and think you see Spider-Man, you probably are. That’s because that day, Carl’s Jr. is giving away a free Grilled Cheese Bacon Burger to the first 50 people who show up at participating locations dressed as the web-slinger, beginning at 11 a.m. I can’t think of a better way to celebrate America’s birthday! If your Spidey suit happens to be at the cleaners, you can still save a buck off a Grilled Cheese Bacon Burger combo by using the coupon available here. Carl’s Jr. restaurants can be found throughout the Inland Empire. I was lucky enough to finally catch Food Truck Thursdays at Fairplex last week and had a trio of amazingly delicious tacos (pork sisig, pork tocino and chicken adobo) from the White Rabbit Truck and picked up some cupcakes from the My Delight Truck for dessert (their snickerdoodle cupcake is out of this world). It’s a great event, with food trucks, fresh fruits and vegetables, homemade candies and kettle corn and beer and margaritas! This week, Fairplex has a whole new batch of trucks to try. 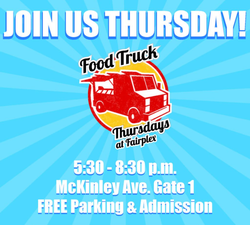 The trucks will be parked from 5:30 to 9 p.m. Thursday (June 28) in the lower administration parking lot in front of the Wally Parks NHRA Motorsports Museum. Our friends over at I.E. Gourmet Food Trucks have assembled a top-notch assortment of food trucks for the inaugural Food Truck and Brewfest. Scheduled trucks include the Zagat-rated Ludo Truck; Zagat food trucks of the week Slummin’ Gourmet, Brats Berlin, Me So Hungry, Lee’s Philly, Rebel Bite, Waffles de Liege and Cousins Maine Lobster; and the the Inland Empire-based Suite 106 Cupcakery and Where’s the Fire? Gourmet Pizza. The event will take place from 11 a.m to 5 p.m. Saturday (June 30) in the Redlands Mall parking lot. Oh, and a little local brewery — Hangar 24 Craft Brewery — will be serving up a selection of beers. Not into beer? Fret not. Time in a Bottle and State Street Winery will be on hand with plenty of wine. The city is also seeking volunteers for the event. For more information or to volunteer, head to the volunteer page on the city’s website or call event coordinator Heather Smith at 909-798-7629. Admission is $5 in advance online here (plus $1.27 service fee) or at Redlands Development Services Office (210 E. Citrus Ave.), or at the door. Attendees are asked to bring non-perishable food items to donate to Inland Harvest food bank. Redlands Daily Facts intern Patricia Diaz has written a preview of the event, which you can read here. Head over the jump to see the full list of scheduled trucks. Update: June was indeed jumpin’, as an estimated 4,000 people attended the event. Click here to read the Redlands Daily Facts’ Suze Knobler’s account of the event, and click here to read more on the wrapup from the the Facts’ Ed Castro. With the impending end (June 30) of foie gras sales here in California, your last opportunity to try (or to indulge in) the delicacy locally is fast approaching. To that end, a smattering of Inland Empire restaurants are offering special dinners featuring the soon-to-be-unavailable ingredient. In Palm Springs, Kaiser Grille Executive Chef Didier Tsirony is creating a five-course prix fixe menu, with each course containing a different preparation of foie. The dinners will be held Wednesday (June 27), Friday (June 29) and Saturday (June 30). Wednesday’s dinner will also feature a selection of wines from Oregon’s Abacela Winery. Seatings are limited to 24 participants per night. Kaiser Grille is at 205 South Palm Canyon Drive. For reservations, call the the restaurant at 760-323-1003. 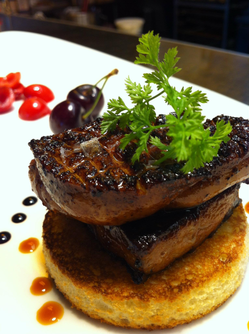 Ra Pour in Rancho Cucamonga is offering two ounces of seared Hudson Valley foie gras with cherries and brioche (pictured above) through the end of the month. Ra Pour is at 7900 Kew Avenue, Suite 5410, in Victoria Gardens. In Redlands, Time in a Bottle, 344 Orange St., is hosting “Foie-mageddon” beginning at 5 p.m. on Saturday (June 30). The second annual Fun Decanted will happen from 7 to 11 p.m. tonight (June 23) at the Wine and Spirits Marketplace Fairplex in Pomona. The event marks the public unveiling and tasting of the award-winning wines, spirits and beers of the Los Angeles International Wine and Spirits Competition. Tickets are $50, which includes a $10 food truck voucher, and are available at the door. The event is a fundraiser for the Learning Centers at Fairplex.